The Lanterns Villa is a privately owned holiday home sitting between Surin and Bangtao Bays, on Phuket's glorious west coast. With a lush tropical garden and private swimming pool, this luxury retreat provides complete privacy in stylish surroundings, and is only minutes' stroll to either of the beautiful Surin and Bangtao Beaches. Click "Enquire Now" to contact owner for a discount on your holiday.........We provide a fantastic, 5 star service and accommodation that achieve consistent, outstanding, reviews from guests. Our hospitality includes housekeeping and options including private chef & dining, and all day to day arrangements. Every effort is made to ensure that you have a wonderful, relaxing holiday. Perfect for families, couples or groups of discerning guests. The Lanterns is 'contemporary Asian chic' in design, tastefully furnished throughout. It's air-conditioned rooms with pavilion roofs and ceiling fans create a light airy feel, and the living areas and master bedroom have lovely views of the pool and gardens with the magnificent backdrop of the Surin Hills. To reassure all guests, 24 hour security is provided. All bedroom linen provided and laundered as part of the inclusive service. Bathroom and beach towels are provided. Welcome pack of staple items and specific extras available on request, at time of booking. There are separate indoor and outdoor dining areas - both accommodating 8+ persons. A basic stereo system is provided but we recommend guests bring their own digital music and portable speaker(s). A fantastic, recently renovated private pool, 10m x 5m. with shallow end. Ideal for all ages. The Lanterns Villa receives 5 star reviews for our hospitality. From the smooth airport transfer, the warm welcomes, excellent housekeeping, and much more. Guests state time and time again that every effort is made to ensure that you have a wonderful, relaxing holiday. Services such as in-house chef, laundry, Thai massage, car hire, airport transfer, baby sitting and equipment are available on request. Your tours and sightseeing can be arranged with our housekeeper. The spacious accommodation comprises: 3 double bedrooms, each with en-suite bathroom and private terrace, spacious living and dining areas, a well appointed kitchen, private infinity pool, BBQ, Thai sala, and parking for 2 cars. For your home entertainment, there is cable TV and WiFi internet connection in the living area with colour LCD television, DVD and stereo, and a small library of books, magazines and games. The property is beautiful. What really makes it amazing is Sa the housekeeper. She is friendly, helpful and polite. We had an unfortunate incident while on the property and she did everything to make the guest we were with feel comfortable and tried to remedy the situation. We went as a family of 8 (incl two kids) to celebrate our mothers 70 years birthday. Lovely house, great pool and of course Khun Sa - she made us feel so welcomed and cooked the best thaifood you could ever imagine! She also helped us to arrange trips and our mothers celebration and everything with a big smile and genuine kindness. We would love to come back some day and can really recommend this property with all of our hearts! Just spent 8 remarkable nights at The Laterns property. As others have said before it was simply magical. Starting with Khun Sa the chef/caretaker. Sa was a wonderful resource in so many ways. Setting up transportation, delicious meals, laundry services, just being a great help without being intrusive. Fiona the owner was also a great communicator in arranging our dates. Even when there were changes she was very accomadating. I highly recommend this property! Coming back to the villa & falling in the pool after a hot day at the beach or shopping was so perfect. 100% perfect! Thank you for taking the time to write such a lovely review. We are always thrilled to have such positive feedback and so happy that you would highly recommend the villa to other travellers. We hope that you can return one day. Our family of 6 had a lovely stay at The Lanterns. Khun Sa made our visit a home away from home and was a fantastic cook! The kids thoroughly enjoyed the pool, and the entire home was clean, relaxing, and welcoming. So happy that you found The Lanterns Villa such an enjoyable and welcoming experience for your family vacation in Phuket. We hope that you can be our guests again in the future. What an amazing stay ! The villa itself is perfect, close enough to everything you could wish for on a family holiday. Khun Sa is an absolute credit to the villa, she couldn’t do enough for us , but also gave the right level of privacy. My two daughters (2 & 3 years old) warmed to Khun Sa very quickly. The facilities in the villa are brilliant, WiFi very quick, and actually , we did have an issue with it, however there was an engineer round 20 mins after us noticing and letting Khun Sa know. I recommend getting Khun sa to cook, and the breakfasts and smoothies were fabulous. There is so much to see and do in the surrounding areas. Strongly recommend staying here - you won’t be disappointed ! Thanks again to Fiona for the great communication. Thank you for your lovely review. You were such wonderful guests and we are so thrilled that you enjoyed your holiday in the villa and got to explore so many things that Phuket has to offer. You are most welcome back anytime. This villa is lovely and very comfortable. We were a couple and 2 singles and it was perfect. The rooms are not very large, so no real room for extra people but luxurious and comfortable for up to 3 couples. The housekeeper was a fantastic cook - and we really know Thai food. This part of Phuket (and maybe all Phuket) looks to be developing very fast but this villa is in a nice quiet spot. Recommended. Thank you for reviewing your stay at the villa. We are so pleased to hear that you found it ideal accommodation for your travel group. You are welcome back anytime. The Lanterns Villa is a relaxed 10 minute stroll to either Surin Beach or Bangtao Beach. With their superb collection of shops, restaurants and luxury hotels, they are the most sophisticated resort areas in Phuket. Both have the necessary tourist amenities and facilities such as ATM, Car Hire, Taxis, Laundry, Shopping, Restaurants, etc. Importantly, healthcare is provided by a number of doctors and an International Hospital clinic is nearby at Laguna. Surin Village itself has excellent, luxury shopping outlets, boutiques, local markets, wine retailers and spas. 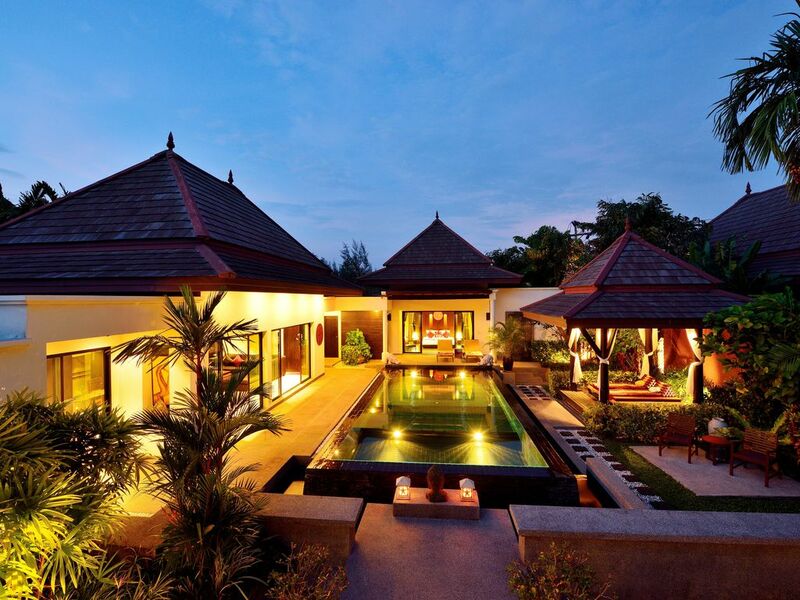 The Villa is conveniently located for all of Phuket's première golf courses. They are all less than 30 mins drive - Laguna is the nearest, less than 10 mins from the door. A little further away (20-30mins), there is world class shopping in Patong and Phuket Town. Some of Thailand's most famous National Parks are close by for kayaking, rafting, elephant trekking and long-tail boat trips. Finally, for scuba diving enthusiasts, some of the finest dive sites in the World await you, for day trips or longer, in the Andaman Sea. Rates are inclusive of maid service, reasonable use of electricity and other utilities (inc cable TV, internet, etc). We will take a returnable security deposit on check-in, to cover damages etc.